An interesting technique, learning how to throw your voice can be a useful novelty. Ventriloquism is based on the throwing of the voice. People who give speeches to large groups of people without microphones use this tool as well. Others are able to alter the pitch and tone of their voice. A skillful person has the ability to cause people to believe that noise is coming from behind them. The talent of throwing the voice is an ancient skill that is interesting to learn. It is important to understand the positions that are useful when throwing the voice. These are often seen when a ventriloquist speaks through a dummy. Experienced artists are able to speak without their lips moving at all. Practice each of these positions to better learn how to throw the voice. If particular words or sounds are easier to make in a certain position, then work your act around the mouth positions that you will be using. This is the most common position used by ventriloquists. The lips and teeth are slightly parted. The lower jaw should be loose to allow the tongue to have freedom of movement. The distance between the lips make different sounds come out differently. This is the position used when an artist drinks water while speaking with their dummy. The open position allows the voice to be louder and better controlled. The negative is that the tongue is able to be seen. Changes in lighting or position will allow the tongue movements to be minimized. This position allows for the artist to show surprise or other emotions. By pulling up the corners of the lips, the mouth is able to make different sounds. This also allows the artist to change the tone and pitch of the spoken words. The smiling position is less likely to be used during normal acts, but laughing and smiling is often contagious. It is beneficial to learn how to pronounce words while smiling. Being able to control and hold the breath is important when successfully throwing the voice. Some conversations between artist and dummy may require long periods of time without taking a breath. It is beneficial to learn how to control the diaphragm as well. Doing these two things will help with training for better control and power of the voice. Increasing the capacity of the lungs is important. This is an essential tool if you want to learn how to throw your voice. Inhale deeply and hold your breath as long as possible. If you find that you can take in more breath, then do so. Try to exhale as quietly as possible. Be certain to learn how to inhale deeply and swiftly through the nostrils, as this will reduce the amount of sounds that would otherwise be created while inhaling through the mouth. Strengthening the diaphragm is beneficial for many reasons. The diaphragm is helpful in maintaining deep breaths. As this muscle increases in strength, the lungs will be better able to hold air for a longer time. It will also be able to exhale with more force, which will make it easier to throw the voice and to make sounds without moving the lips. Attempt to inhale using your diaphragm rather than with your nose and upper chest muscles. The goal of throwing the voice is to eventually be able to communicate. Learning how to control the voice while exhaling, groaning, using the tongue and changing the shape of the throat is important. At the beginning of practice, it may seem as though you are making meaningless sounds. With practice, these sounds will become words and eventually become sentences. After taking a deep breath through the nose, allow your body to slowly exhale through the larynx. Try to maximize the time that it takes to expel all of the air in the lungs. See how long you are able to exhale before inhaling, as this will help your body make sounds with little air. Make sounds with muffled air at first, and then gradually try to make the words become more loud and clear. Make groaning sounds while exhaling. See how you can change the pitch, tone and volume of the sounds. Additionally, try to make the “ah” and “oh” sounds. You will want to attempt to make every sound possible while exhaling. Experiment with the speed and intensity that you are exhaling and see what different sounds can be made. Press your tongue against the roof of your mouth when making sounds. Use the tip of the tongue and the back of the tongue. Allow the tongue to press against the back of the teeth or curl upwards. See what movements make muffled noises and which allow for difficult sounds to be made. Muffled sounds help to make the voice sound as though it is coming from a different location. The larynx, or voice box, can be controlled with practice. The area behind the tongue may also be expanded or contracted. 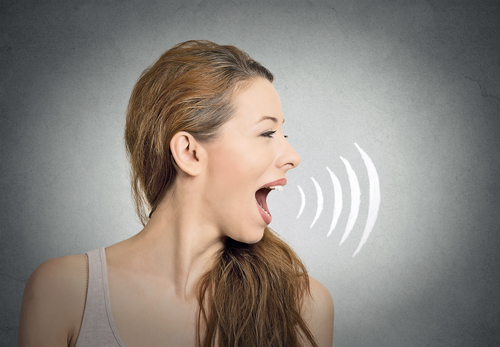 Along with the throat, see how changes influence the sounds that you are making. Learn how to make more difficult sounds. Be certain to mix throat control with tongue control and exhalation. By altering the variables, you will be able to make more challenging sounds. The most challenging sounds are those that use the lips. This is obvious, as the main purpose of learning to throw the voice is to act as though you are not making the sounds. B, F, M, P and V may be difficult to make. For sounds like B and P, aspirate sounds may be used by placing the tongue against the back of the teeth and releasing it. Vibrating sounds, like F, M and V, also require similar movements. Learn how to adjust the pressure and vibrations to make particular sounds. Take an audio recording of yourself, take notes of your actions and learn which adjustments are most effective. Keep in mind that practice makes perfect, so keep up your training as often as possible.